I have very few goals in life at this point, but of those few goals I am aware of, I am very, very committed to obtaining and achieving. Tonight is a perfect occasion to address such a goal, especially as I sit here, typing away on such a gorgeous evening and am run-less on the day. I know I have always been an evening-based runner. It’s just the nature of my inner clock, if you will. I feel too sluggish in the morning, but regardless of the terrors and trials of the day, I can go out at night and totally dominate a run. That worked well out on my own in the suburbs, not so much in the city. It’s not that I would venture to locales unsavory, but it’s hard to feel safe running by ones self in an urban setting, especially when you are as delicate a flower as I am. Enter my longing for a running companion. I’m not one to run with an iPod as I find it to be unsafe no matter the situation, and fellow humans have their own agendas. I’m looking at the four-legged variety. While I might have a pair of felines right now, I desperately want two dogs (yes, two. A dog needs a friend) to call my own. I’ve sadly denied myself such in an effort of being a realistic responsible adult in the face of my unpredictable work schedule so as to be fair to a dog (no dog should be left alone for 10-12+ hours, my opinion. Cats are a different story. Mine can ignore me for a weekend). I think we can all think of a friend or acquaintance who might have done such without the pet’s best interest in mind. It usually doesn’t work out (which is why shelters abutting college campuses rarely adopt out to current students). My 2011 goal (and I proclaimed such on New Year’s) is to become the proud owner of a very happy creature who wouldn’t mind going out on a run with me when I so chose. I grew up with a fair number of dogs, but I only ever ran with one. Tony, a black German Shepard, was discovered at the DuPage county pound in spring 1995. She was so excited when she first met my entire family, she piddled on my black LA Gear shoes. 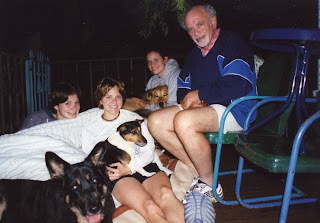 The pair of dogs my family had from a young age until that point (I was 11 then) both died within a few days of each other, a heartbreaking story I’d rather not get into. The canine void was far too great, so my mom set out to replace them. Tony was about eight months old when we got her; one of her ears drooped due to a previously abusive home. She had aggression and mistrust issues with other dogs, but was a fiercely loyal and smart dog. Because of said abuse and lack of care, she had worm issues and required surgery not much longer after we got her. She dropped down to a horrendously skeletal creature, in the range of around 45 pounds. She recovered and filled out with food and good walks/playtime. The tennis ball was her toy of choice. In seventh grade after the conclusion of the abbreviated cross country season, no one met up after school for practice in the numerous months between October and the start of track season in the middle of spring. So I would set out after school on my own and run three miles with Tony. We had two other dogs at the time; a perpetually barking Golden Retriever named Tosca (who is still feisty at 16 years old) and a little Terrier named Tisha (who is about 13-14 and just successfully recovered from a torn ACL this past winter. What can I say: my mom is a zen master of having long-living pets). Neither of the other two really were runners. Tony was. She listened to commands well and was good on a leash (imperative to successful dog controlling), it was just seeing another dog that she, well…kinda got out of hand. She barked and she pulled (which isn’t the greatest thing when you are sub five feet tall with an 80 lb. dog) but generally got over it upon passing another creature that she deemed evil or a threat. Tony is in the foreground, a scared-looking Tisha in my arms while Tosca is in the background, plopped on elder sisters lap. My younger sister and I look eerily related in this photo. I’d love having that sort of companion again. As my life grows more and more adult-like and property ownership looms in the near future, it would be nice to have a sense of security awaiting my return at home, and as swell as my cats are, nothing really beats the pomp and circumstance a dog brings upon seeing you after a long day away. The adoration would be appreciated. I think it would be nice having a more structured schedule so as to go on a stroll with a dog pre-work and then come home and run a few miles to burn off some steam at the end of the day. It certainly doesn’t help me that I currently live kitty corner from a dog park, either. Cruel world, have at thee. In an ideal situation, I’d like get a puppy as my dear gent Mike was completely denied a dog growing up by his parents (I don’t understand such, I really don’t) and having the experience of puppydom is a MUST, I feel. But again, it’s all situational and if that’s ultimately not the best fit, then I am more than happy to get a more mature pooch. Yeah, I want them all. And someday very soon, one will be mine. And we will be out traipsing along some well-lit sidewalk right about now. Count on it.